An icon of Istanbul, the Hagia Sophia (Holy Wisdom) combines famed architecture and art with an atmosphere of intense spirituality. 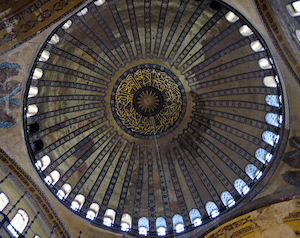 Built by Emperor Justinian as a cathedral, the Hagia Sophia was converted into an imperial mosque by the Ottoman Empire in 1453, and in 1935 under Mustafa Attaturk’s orders became a museum. The UNESCO World Heritage site is one of the most frequently visited monuments in the world. The Hagia Sophia is best seen with a tour operator, as those who buy their own tickets will spend much of the day in an endless line that snakes back and forth across the outlying plaza. Tour operators save you from that line, whisking you and your group into the building while providing you with expert and entertaining commentary. Tour operators in Istanbul go through extensive training, and besides having to learn many languages, are versed in everything from mythology to history to architecture and more. Just ask them a question. You’ll be amazed at what they know! If you go in the warmer seasons, be sure to take advantage of the numerous fruit and juice vendors surrounding the building. Juices are fresh squeezed and fruit seems entirely unrelated to the pallid fare we often find in American supermarkets. My particular favorite was a watermelon boat (watermelon stands in Istanbul are as ubiquitous as pretzels and hot dogs in New York City), an intoxicatingly sweet, juicy handful of large slices of watermelon served in its own little boat-like container, perfect for munching while exploring. You might want to plan your visit soon. The conservative Turkish government is currently pursuing plans to convert the Hagia Sophia back into a mosque, which may limit access for visitors. 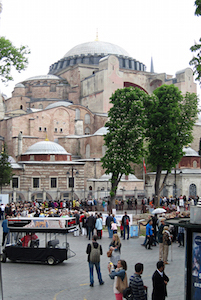 The Hagia Sophia is available every day for visiting except for Mondays. From April 15 through October 1, the hours are 9 a.m. through 7 p.m., and from October 1 through April 15 it is open from 9 a.m. through 5 p.m.